Who likes Caviar? I do! I am fully aware that Caviar grosses out many people, because they tell me all the time. I was introduced to it at a young age and liked. I don’t think I exactly knew what it really was until I was in my early teenage years. Back in 1987 I saw a very interesting documentary that showed every step in the making of this delicacy, beginning from the catching of the fish in the Caspian Sea, clearing out the eggs from the fish’s belly, the cleaning and salting of the eggs, to the packaging. I have to be honest, it was a bit much to see it all come out of the fish’s belly. But honestly speaking, all of the funny feelings were quickly sent off packing when some delicious caviar was served just after the documentary ended. 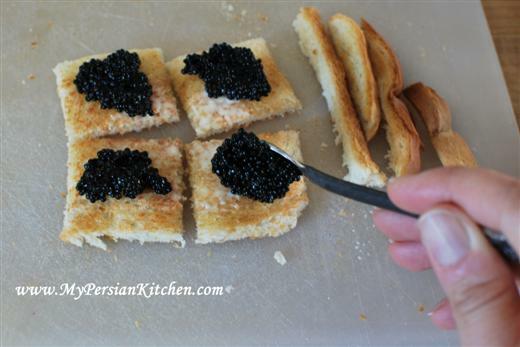 Ahhh the deliciousness of Caspian Sea Caviar. LOVE IT!! I am not a Caviar connoisseur but here is what I know: Caviar is divided into three categories Beluga, Osetra and Sevruga. They are all different in prize, the first one being the most expensive. They don’t all taste the same nor are they all the same size. You will often say that the best Caviar comes from the Caspian Sea. 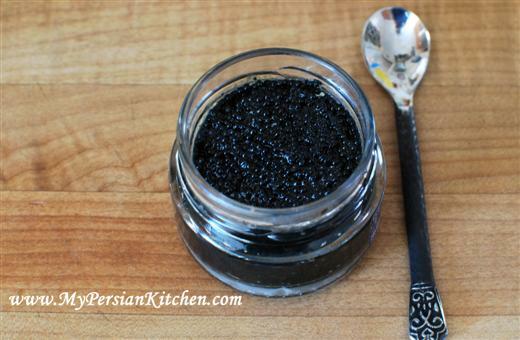 Both Iranians and Russians export Caviar. 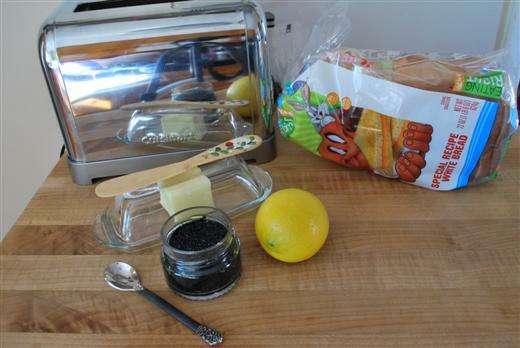 I have seen people get too creative with Caviar, but in my humble opinion the best way to enjoy it is on top of a lightly buttered toast with a squeeze of fresh lemon. Simple, yet so good! 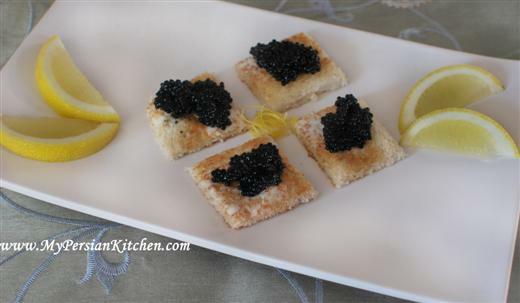 So in honor of today being New Year’s Eve, I present to you a fancy appetizer: Caviar! See? This is all you need…about the bread. So I never ever buy white bread. I simply picked this brand because it had Bugs Bunny on it, cause you know it’s all about Looney Tunes! 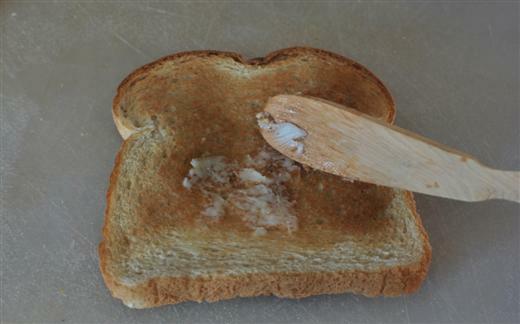 Toast bread slices and spread butter when the bread is still nice and hot. Be sure to use good quality butter, it really does make a difference. 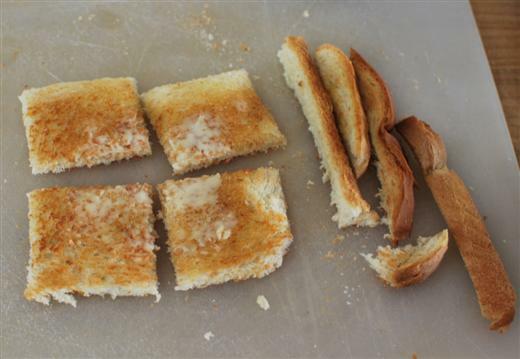 Cut bread crust and divide the toast slice into four squares. 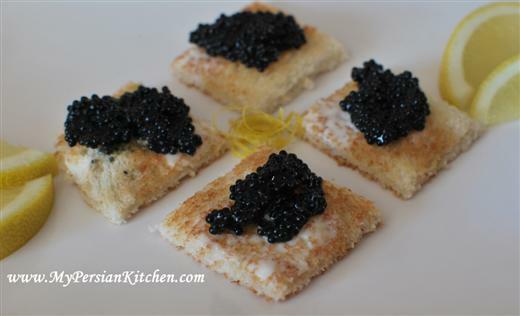 Place a dollop of Caviar on each slice. Arrange on a plate along with lemon wedges. All you need to do is squeeze the lemon on top and eat. YUM! Wishing you all a Happy and SAFE New Years Eve! Happy 2010! Very festive and fun. I have to admit, though, I never developed a taste for caviar. I have tried it several times, and it’s just not my thing. 😉 Too bad, because it’s so luxurious. You are awesome! Thank you!! I Congratulations to you to see this site,actually!